The spherical coordinates calculator is a tool that converts between rectangular and spherical coordinate systems. It describes the position of a point in a three-dimensional space, similarly as our cylindrical coordinates calculator. For a two-dimensional space, instead of using this Cartesian to spherical converter, you should head to the polar coordinates calculator. Coordinates are sets of values that describe the position of any given point in space. For a three-dimensional space, you need exactly three coordinates to uniquely define a point. 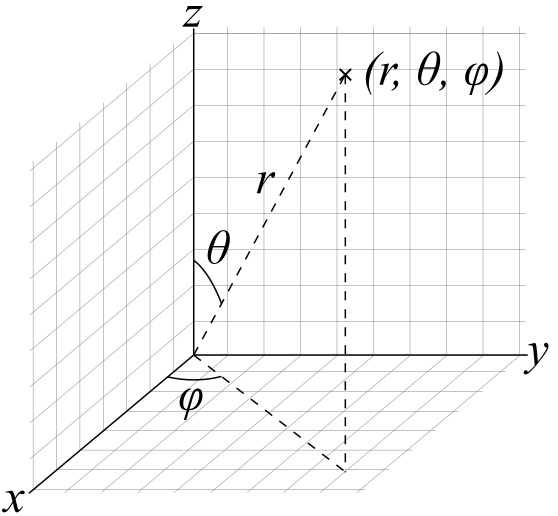 The Cartesian system, also known as the rectangular coordinate system, is constructed by drawing three lines in space. They all cross a common point, called the origin, and are perpendicular to one another. These lines are called the axes of the system. Each pair of axes defines a plane: these are called the XY, XZ and YZ planes. The coordinates of any arbitrary point are defined as the distance between that point and the planes. Spherical coordinate system is defined by a fixed origin and a zenith direction. The zenith is an imaginary point located directly above the origin. The direction from the origin to zenith is called the zenith direction. Each arbitrary point in space has three spherical coordinates. The first one, called radial distance or radius (r), is simply the three-dimensional distance between the origin and this point. The second one - the polar angle (θ) - is the angle from the zenith direction to the line that connects the point with the origin. The third one is called the azimuth angle (φ). When you create a reference plane that passes through the origin and is orthogonal to the zenith, then φ is the angle between the point's orthogonal projection to the plane and a fixed reference direction on that plane. 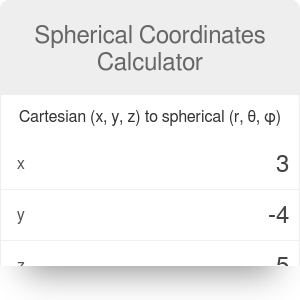 When converting from the rectangular to the spherical system, our spherical coordinate calculator assumes that the origins of both systems overlap. It also assumes that the z-axis is equivalent to the zenith direction. The spherical reference plane coincides with the XY plane. (r, θ, φ) are the spherical coordinates. Spherical Coordinates Calculator can be embedded on your website to enrich the content you wrote and make it easier for your visitors to understand your message.